BELLE PLAINE, Minn. — The city council of a Minnesota city voted narrowly on Monday to return a memorial featuring a soldier kneeling before a cross tombstone to a public park after veterans reluctantly agreed to cut the cross off the display due to a complaint from a prominent professing atheist organization. Council members in Belle Plaine voted 3-2 to create a “limited public forum/free speech zone” in Veterans Park, which they believe will solve the issue. 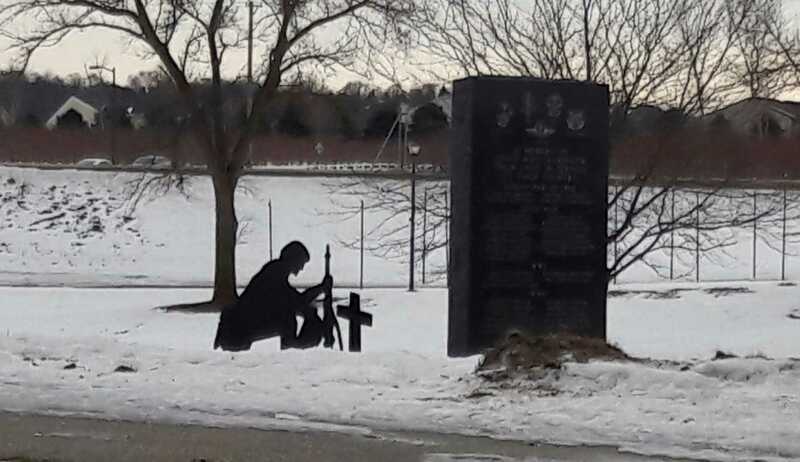 City attorney Robert Bose told local television station KMSP that while the logistics will still need to be worked out, the plan is to allow all citizens to apply to have their veterans memorials displayed. “[The limited public forum] ensures that there is no endorsement of religion by the city whatsoever because the memorials that will be put up represent the citizens that put them up,” also explained Alliance Defending Freedom’s (ADF) Doug Wardlow. As previously reported, the Belle Plaine Veterans Club had recently placed the display in Veterans Park next to an inscribed stone honoring local residents who had lost their lives in various wars, from the Indian War of 1862 to the Korean and Vietnam Wars. The silhouette showed a soldier kneeling before a grave marker in the shape of a cross, such as are seen in some military cemeteries. But the Wisconsin-based Freedom From Religion Foundation (FFRF) contended that the inclusion of the cross in the display promoted Christianity and failed to represent other religions or those who reject religion. It asked that the symbol be removed since its placement on city property could be construed as government endorsement. It contended that even though the purpose of the display was not meant to be religious, the cross grave marker made it so. City council met over the matter last month, and members of the Belle Plaine Veterans Club reluctantly agreed to cut the cross off the display at the recommendation of Vose. “It was probably one of the hardest things that I had to do in a long time … to come up and cut this thing off of there,” local veteran Joe Burmeister told local television station KARE. He said that a number of residents are upset that the symbol had to be removed. FFRF says that it is concerned that the city has decided to bring the memorial back in totality, and says if the plan goes forward, it will propose a memorial of its own to atheists in foxholes. “Whenever the pillars of Christianity shall be overthrown, our present republican forms of government, and all the blessings which flow from them, must fall with them,” he stated.